Jim is an average New Yorker living a peaceful life with a well paying job and a loving family. Suddenly, everything changes when the economy crashes causing Jim to lose everything. Uwe Boll seemed to take the general concept of one of his other films titled Rampage gives a Wall Street twist and makes a new film. It may be his best film yet but that still isn’t saying much. The story follows Jim (who is never given a last name) who is working long hours at his security job trying to pay for his wife Rosie’s medicine for Cancer. Shortly after he realizes he doesn’t have the money and his insurance isn’t covering it he goes to sell his stocks only to find out that they’ve been lost and he owes more. Between lawyers, his wife’s illness, and work the decline in not only his mentality but his wife’s as well starts to show. Add that on top of a few major plot points that happen later in the film and it sets the mood for the last portion of the movie. 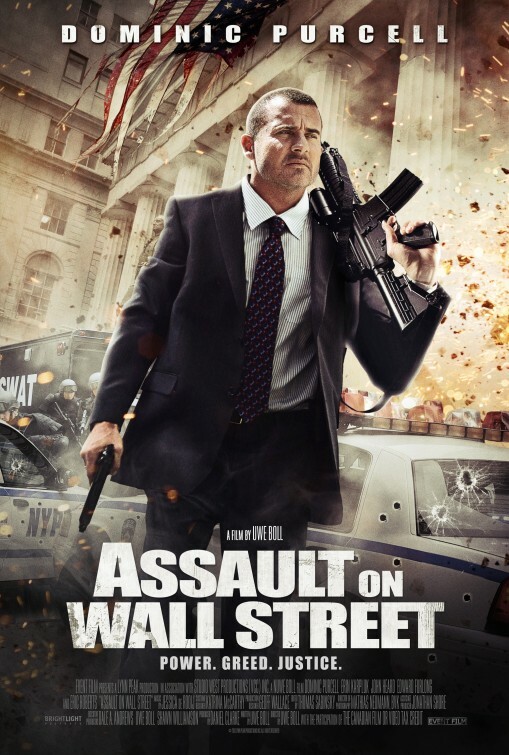 Assault On Wall Street suffers from the main point that made Rampage bad though with the slow pacing. The first hour or so if the draw up to the finale but other than a few small scenes the pacing is so slow. None of the characters are really likeable at all. I mean they don’t even care enough to give the two main characters a last name. The entire time as well they are constantly trying to push the thought about the evils of Wall Street which have little effect on your thoughts during it. Dominic Purcell does a decent role as “Jim” since the majority of his time on screen is either playing a sad quiet man or a angry man both of which are roles he has done before. Every other role is instantly forgettable and about as paper thin as you can imagine. It is worth a laugh that Keith Davis is a star in this as a cop buddy though who does little for the movie. When the moment hits and the action begins though it does raise it up. Surprisingly it does actually get bloody and the body count piles up in a quick time but almost just as quick as it begins it is over. This can also be labeled as another misleading cover because at no time does anything resembling the cover happen. A short burst of action even mixed into a ridiculous over the top story is decent though. Uwe does deserve credit for making the end twist almost too stupid though. I guess by doing so he made it to where a sequel could happen not that anyone would be asking for one. Is this worth a watch? In short, no. With a bad and at times laughable story which leads to a grand finale that ends up getting over just after it begins its hard to recommend this to anyone. Just throw this into the pile of all the other Uwe Boll movies that we can do without.